Add these dates to your calendar if you would like to participate. Happy New Year to you all. We are very excited about the launch of the open and registration-free course (or open magical box, if you think it is more appropriate) #BYOD4L. 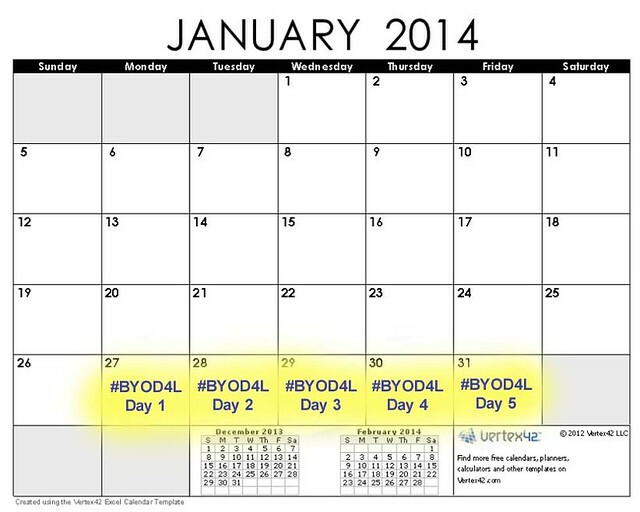 At the moment, we are adding the finishing touches to the course site but thought to share it with you so that you can get a flavour of #BYOD4L and decide if you would like to join us from the 27th to the 31st of January 2014. Have a look around and let us know what you think and if you have any ideas and suggestions before we start, please leave a comment here or via Twitter using @melsiguk and the hashtag #BYOD4L. Please note, there is NO registration for this course. Feel free to complete our short initial survey if you wish. We would recommend to start following the site (see button on the right hand side) and @melsiguk on Twitter to receive all updates. Thank you so much for stopping by and see you again soon.